The goal of a WRAPS Implementation Project is to expeditiously implement the watershed action plan. Stakeholder education and involvement are important components of every WRAPS project, especially Implementation Projects that collectively often take several years to fully implement. Hosting informational meetings/workshops, tours, demonstration projects and developing printed materials (brochures) are two ways of educating stakeholders. 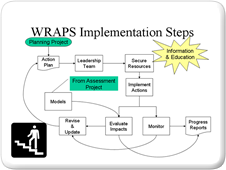 Regardless of the methods, it is important that stakeholders remain engaged in the process of developing the WRAPS and are informed of the successes and milestones in implementing the action plan. Securing the resources needed to implement the watershed action plan can be challenging. Human resources involves staff time to implement actions outlined in the plan, monitor progress in achieving goals, and administrative duties such as submitting reports to granting agencies. Financial resources include grant and cost-share funding and in-kind contributions from stakeholders and project cooperators. Technical resources take the form of technical assistance provided by agencies, organizations, and others. 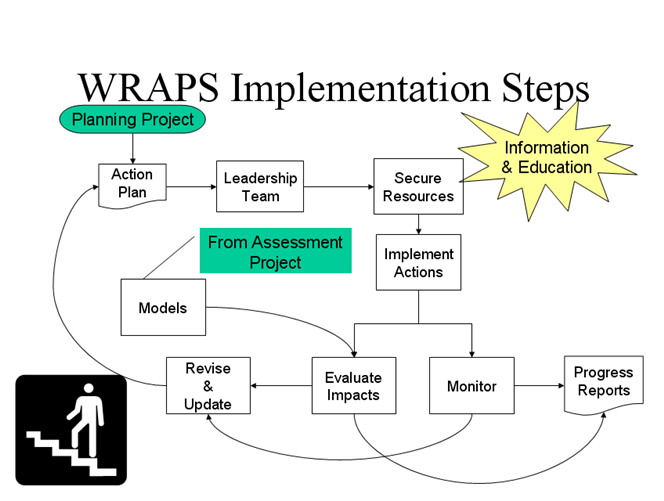 The implementation of a WRAPS involves coordination of various human, financial, and technical resources involved in the actual execution of restoration and protection measures identified in the action plan. This will include the physical construction of BMPs or other structural practices, the development of policies and ordinances, and the initiation of education/outreach campaigns. Evaluating progress toward achieving watershed goals is important. This often includes ongoing monitoring to assess improvements or changes in watershed conditions. An example would be monitoring for certain types and levels of pollution. Other ways of measuring progress include evaluation of stakeholder involvement and education efforts. Developing and implementing a watershed action plan is an ongoing process. If watershed goals are not being achieved or if specific actions are not being implemented in the timeframe identified, it will be necessary to update the plan to identify alternative actions or timelines that reflect changes in the availability of resources, or that reflect new information about watershed conditions, and/or address new issues/concerns on the part of stakeholders.